Easy to make, and great to the taste. As you will see, even the kids will love this, and it can easily be altered to a veggie-friendly version, too! 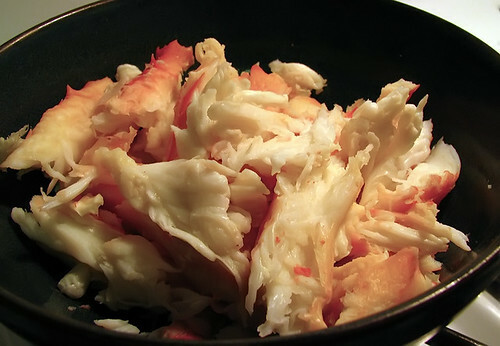 Using kitchen shears or a nut cracker, shell crab meat, break into large bite-sized chunks, cover and place in refrigerator. Finely chop green onion and mince garlic. Set aside. In large sauce pan heat butter and oil. Saute garlic until translucent. 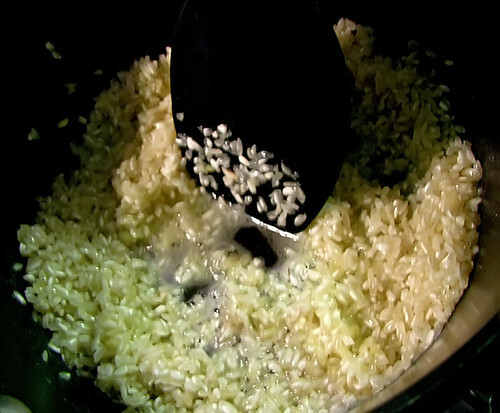 Add rice and saute another 2-3 minutes. HINT #1: For even more artichoke flavor, use the marinating oil from the artichoke hearts instead of the Olive Oil. 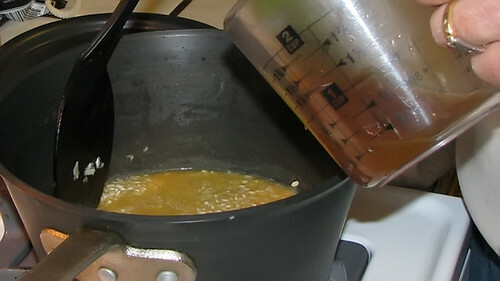 Very slowly add 1 cup of the broth to the rice, stirring almost constantly and making sure that liquid is absorbed by rice before adding more broth. Continue adding broth 1 cup at a time in this fashion. 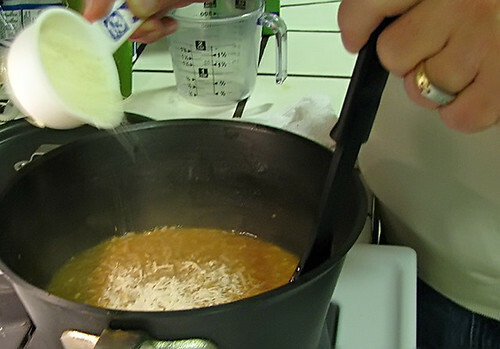 Once liquid is mostly absorbed by rice, slowly stir in parmesan cheese. Reduce flame to low. 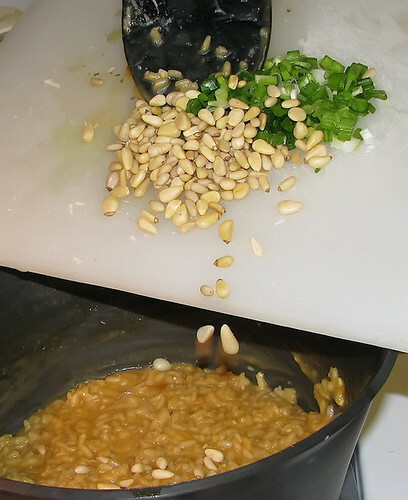 Now, add green onions and pine nuts. Stir in well. 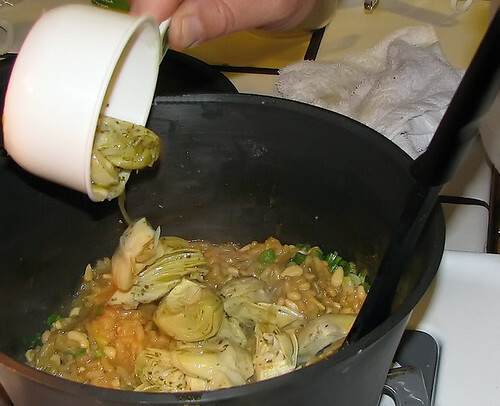 Add artichoke hearts and very gently fold into Risotto mixture. If it’s an all-carnivore crowd, skip to the next step. But, if you have any vegetarians in the group, go ahead and remove suitable amount to serve them. 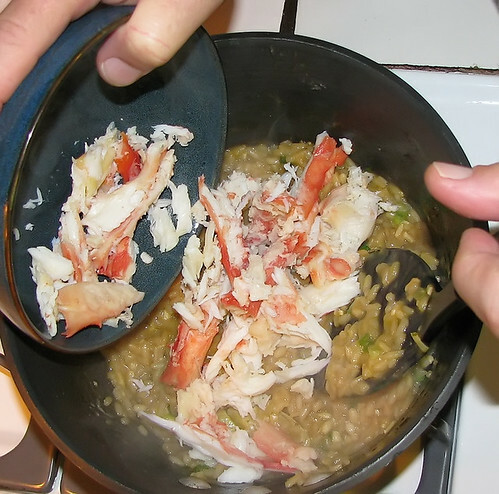 Add crab meat and very gently fold into Risotto mixture. Try to keep the crab from breaking up too much. Cover sauce pan for about one minute until crab warms. Serve with salad and warm bread. This entry was posted on December 16, 2009 at 5:39 AM	and is filed under Italian, Main Course, Seafood, Vegetarian. 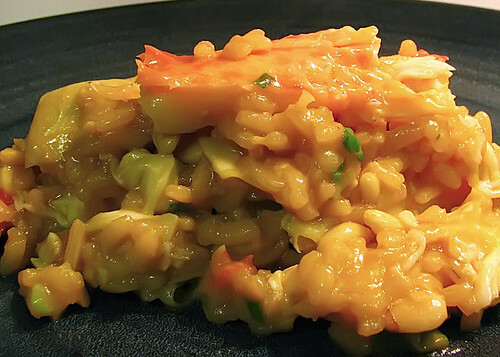 Tagged: artichoke hearts, cooking, food, king crab, rice, risotto, Seafood. You can follow any responses to this entry through the RSS 2.0 feed. You can leave a response, or trackback from your own site. Thanks, LV! 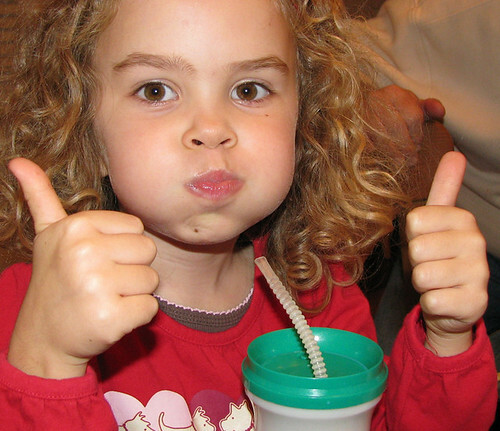 Our kids get more adventurous in their tastes everyday … it’s SO cool!! A funny thing happened in our home the other night. I read and commented on your post about the Wontons and my mouth was watering. Crab legs do that to me, what can I say. My husband came home from work and said, “Hey, you want to order a case of King Crab Legs?” A guy he works with who went to the Culinary Institute a few years back said he was ordering some. If several people ordered we could get these for about $6 a pound. Let’s just hope there is not some strange catch like…oh I don’t know…me having to gear up and head out on one of those crab boats on “Deadliest Catch” to haul in my own case or something. This and the Wontons, I’m making them as soon as the holidays are over! $6 a pound?!?! You can’t beat that price with a stick! Let me know how those recipes work for you. 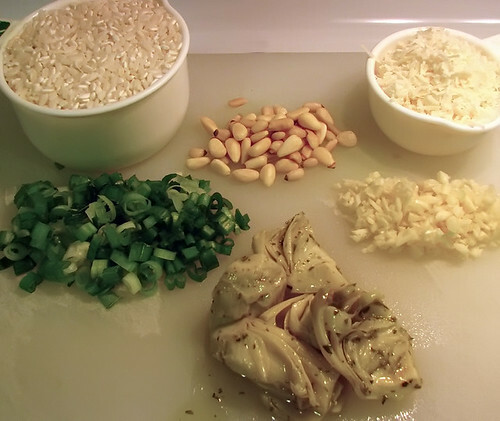 BTW, put together a new wonton recipe tonight for the big family shindig … LAMB! Yummmmmm!!! They were a huge hit. So, I’ll post that up soon, too. I wouldn’t mind being on the Time Bandit. I sorta have a thing for Johnathan. Only I’m not touching that bait. And I don’t like rough ocean seas because I get sea sick. I’m also claustophobic, so being stuck in the bottom of those cramped living quarters would do me in. On second thought, maybe I’ll just pay the $14 a pound for the crab and forget all about the cheaper price. Looks Fab and I bet tastes even better! 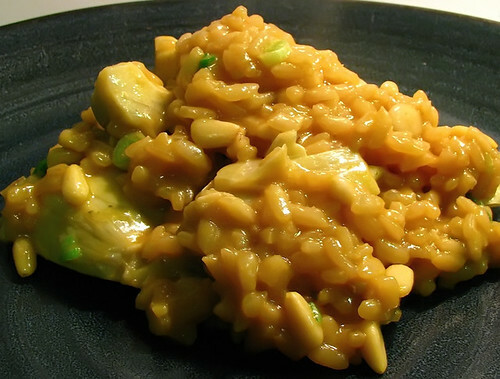 Lovely dish!I really enjoyed reading your blog caveman,I like your writing style, the easy recipes and awesome photos! You know what,Foodista announced that they are going to publish the best food blogs in a full color book that will be published by Andrews McMeel Publishing this Fall 2010. You have some really great recipes and I thought how great it would be if you could join in this event! You can find out more about it at this link.Sorry I had to leave this message here.I wanted to email you but couldn’t find it,so I dropped this one instead. Hope you do join. Thanks! Thanks, Alisa. I truly appreciate your kind words! I’d love to be a part of your book. Sorry about not finding my email address. I guess I’ll have to include a “Contact” page on the site. In the meantime, you can contact me at CAVEMANCOOKING at CA dot RR dot COM.